WASHINGTON (Army News Service, December 03, 2013) – Far from home and stationed in a remote outpost in Iraq over Christmas, Sgt. Jonathan Thibault remembered the comfort of receiving cards from school children and other members of the public during the holidays. Thibault was in Iraq on a year-long deployment. He had two small children at home and a wife in the Army at the time. He said those heartfelt messages meant a tremendous amount to him and the others at the small base, Combat Outpost Nimur, in 2008. “For those guys to receive letters, it was the thing that made Christmas for them in a place where the environment is not covered in snow and cheer but with sand and fear,” he said. Members of all branches of the military will likely find that same comfort and joy in similar messages when the Red Cross makes it rounds again this year in delivering bundles of cards for the holiday season. The Red Cross brings cards with special messages and greetings to veterans, military families and deployed service members worldwide, said Red Cross spokesman Peter Macias, who is the program lead for the Holiday Mail for Heroes program. The program began in 2006, and has received 6.8 million cards over the past six years, Macias said. “People send the most wonderful messages,” he said. Cards come from all segments of society, including from children, faith-based groups, and from employees who are sending greetings from corporate-sponsored writing events. National Football League teams are also involved in the program and have held events for fans to write cards for service members, he said. Service members who are deployed, forward stationed, or just far from home, take special joy in reading the messages, he said. The card-writing initiative gives people the chance to thank a service member, send a greeting, and spread cheer, he said. The deadline to send a card for this year’s Holiday Mail for Heroes program is quickly approaching, he said. Cards must be postmarked by Dec. 6, Macias said. 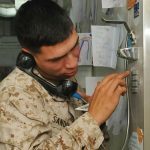 He advises senders to use a generic salutation such as “Dear Service Member” since the cards are distributed around the globe to all military branches. The Red Cross is also using social media to spread holiday cheer to service members, veterans and military families. Make a video on Vine, take a picture on Instagram, or send a greeting on Twitter, Macias said. All cards sent to the Red Cross are screened for dangerous materials. The cards must not include any items inside. The Red Cross advises senders to make sure they sign the card and to not mail cards with glitter, as it can aggravate health issues of ill and injured warriors. More information can be found on the Red Cross Holiday Mail for Heroes website. The messages, which take just a few minutes to write, mean so much to service members, Macias said. Thibault said the cards he and the other Soldiers at his outpost received expressed how proud the nation was of the service members, how much their sacrifices meant, and how Americans could be home safe for the holidays because others were fighting overseas. The cards put him and his wife at ease, knowing their sacrifices were for the greater good and their children will later be proud of those choices, he said.